In what was always going to be a difficult campaign, the 2019 Allianz football league promised much for the Tipperary footballers, but unfortunately it failed to deliver, as an injury plagued side paid the ultimate sacrifice which signalled a return to division 3 for next season. In going down to Clare last Sunday in round 7, on a 3-15 to 1-19 score-line, the players could not be faulted as they gave of their all to stay up. They are division 2 material, of that there is no doubt, and the hope now, is with a fully fit squad at the managers disposal they can make a swift return next season. Unfortunately, being participants in an excellent game of football and still coming out second best with one of the highest scores on the final day of league offers little comfort, but it does portray the level of effort committed by the players. Before an attendance of 1,431 Conor Sweeney (Ballyporeen) had a starring role shooting 1-9 and lead by terrific example as Tipp took the game to Clare only for then to see it wrestled out of their grasp in the dying moments of this league journey. Tipp will dust themselves down and with the prospect of colleagues coming back from injury; they will no doubt refocus the sights and take aim at a determined shot at the Munster championship where first up it will be a home quarter-final tie against Limerick on Saturday, May 11th at 7pm. Congratulations to the Tipperary Ladies Gaelic Football team who had a deserving 1-15 to 2-11 win over Monaghan in the Lidl NFL Division 1 clash also in Semple stadium on Sunday last. This win ensures Tipperary stay in the division for next season. There was also a good win for the Tipperary camogie team as they defeated Carlow 1-20 to 1-4 in their division 2 tie in the Littlewoods Ireland Camogie League. The 2019 Electric Ireland Munster GAA Football Minor Championship is next on the agenda for Tipperary followers when Matt O’Doherty’s side get their phase 1 campaign under way on April 10th against Waterford at a Tipperary venue. Best wishes to Derek O’Mahoney (Ardfinnan) as he will take charge of the Allianz Football League Division 2 final between Donegal and Meath in Croke Park on Saturday next, March 30th at 5pm. This weekend sees the first of the action get under way in three of the divisional senior championships with a host of other games down for decision as well. 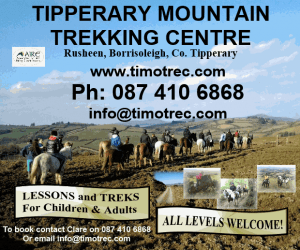 Tipperary CCC has also announced the times and venues for the first rounds of the Tipperary Water Senior, Seamus Ó Riain and Intermediate hurling championships which will take place on the weekend of April 6th and 7th. Congratulations to Borrisokane C.C. who are the Masita GAA Post Primary Schools Michael Cusack Cup (Senior C Hurling) winners following their 1-22 to 1-12 victory over Coláiste na Coiribe (Galway) in the final in Duggan Park, Ballinasloe last Saturday. The All-Ireland 40 x 20 juvenile and adult singles finals were hosted by Kingscourt at the weekend. Tipperary were through to one juvenile final and three adult finals. 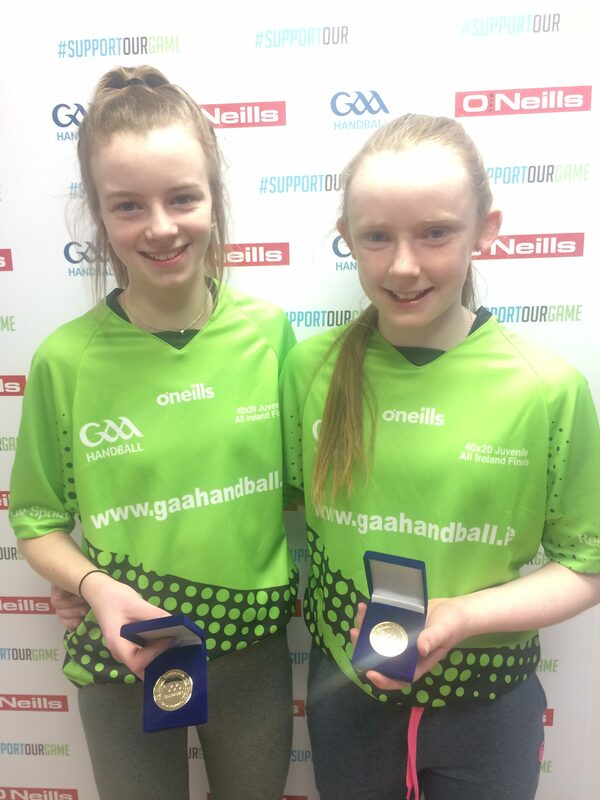 In the Girls U14 Doubles Hannah Grace and Leanne Gould (Lahorna) were in top form once again and had a convincing win over Leah Ní Mhainnin & Cliodhna Ní Chonghaile from Galway winning 15/3, 15/8. The winning Tipperary duo are pictured right. In the adult grades John Kennedy (left) from the Silvermines was on top throughout in the SMBS and coasted to a 21/8, 21/8 victory. In the MBS Brian O’Brien got off to a poor start and was unfortunately defeated. Congratulations to the Tipperary winners and well done to all involved and we now look forward to the All-Ireland adult doubles semi-finals on Sunday April 14th against Leinster opposition. For her lifelong commitment and leadership role in the great, continuing work of Aiseiri Sister Eileen Fahey is a worthy winner of The Tipperary Association Dublin Hall of Fame Award. 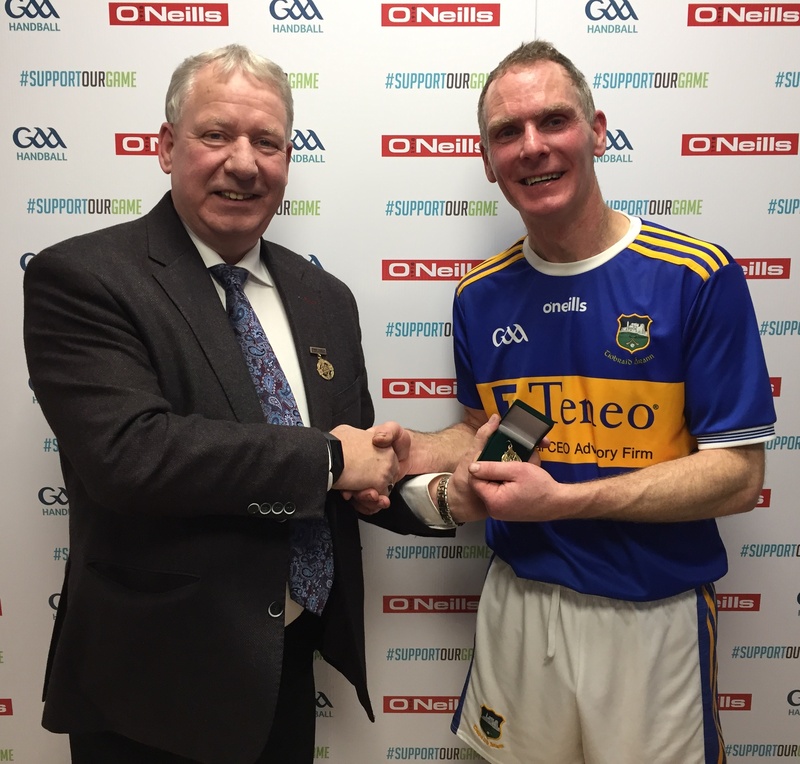 We express the sympathy of Tipperary County Board and supporters to all bereaved recently, including the family of the late Tommy Mulcahy, president of Nenagh Eire Óg GAA Club and recipient of a Laochra Gael award in the Dome last November in recognition of his lifetime of service to the GAA. Sympathy also to the wife and family of the late Pat Ryan (Ger) Littleton and a member of Moycarkey-Borris GAA Club. Pat was on the Tipperary minor teams of 1954 (sub) which lost to Dublin in the All-Ireland final, the 1955 side which beat Galway in the final and was captain in ’56 when Tipp defeated Kilkenny. He was also on the Tipperary intermediate team which defeated Cork in the Munster Final but lost the All-Ireland final after a replay against Wexford. At that time Pat was a member of the Tipperary senior hurling panel between 1958 and ’64. Tipperary defeated Dublin 0-16 to 1-12 in the ’61 final and Kilkenny 5-13 to 2-8 in the ’64 final. As this month draws to a close, just a quick reminder that March is gambling awareness month. Problem gambling has become a major concern in modern society. Gambling can be difficult to give up but there are services and supports available no matter how hopeless the situation may feel. If you have a gambling problem or you are someone concerned about a family member or friend who you think might have one the following websites will be of help. If you wish to include any item of interest in future articles, please e-mail at pro.tipperary@gaa.ie on or before 3.00pm on Monday. 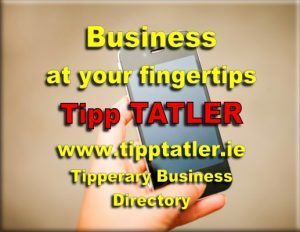 Visit the Tipperary GAA web site at http://tipperary.gaa.ie to keep up to date with all the latest news in Tipperary GAA circles.